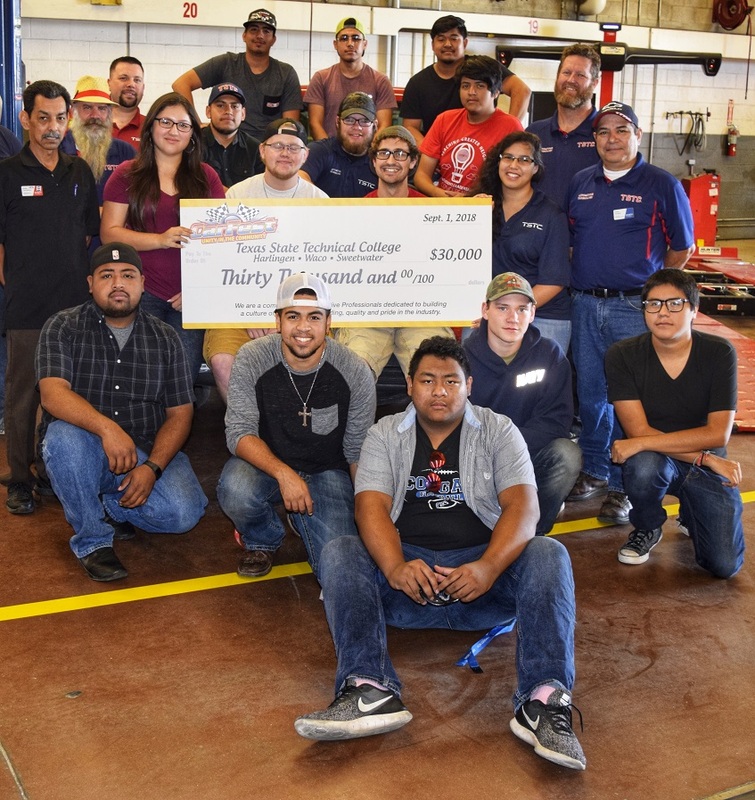 (WACO) – Texas State Technical College’s Automotive Technology SkillsUSA Club not only celebrated Wednesday its formation this semester, but also a financial contribution to rev up the program. The TSTC Automotive Technology program announced a $30,000 gift from CarFest in San Antonio for participating in the two-day event in the spring. The money will be divided between TSTC’s Automotive Technology programs in Waco, Harlingen and Sweetwater for tools, scholarships and educational travel opportunities. This year marked the third time TSTC in Waco has sent students to CarFest to repair vehicles and educate visitors about the Automotive Technology program. Garrett Carlson, 21, of Llano was one of the Automotive Technology majors who made the trip to the Alamo City. Carlson is one of the students taking a new Career Essentials class being offered this semester in the Automotive Technology program. The curriculum is from SkillsUSA and teaches students skills like decision-making, multicultural awareness, responsibility and leadership. Chris Perales, a TSTC Automotive Technology instructor, will lead the class with the help of program instructors teaching specialized lessons. His inspiration for starting the class, which will double as training for state and national postsecondary SkillsUSA competitions, was the trip he made as part of the TSTC statewide delegation to SkillsUSA’s 54th annual National Leadership and Skills Conference in late June in Louisville, Kentucky. The Automotive Technology SkillsUSA Club is open to all TSTC students. The group meets on Wednesdays at noon and two hours on Friday mornings for hands-on work. Krystal Marshall, 19, is a Visual Communication Technology from Waco, is secretary in the Automotive Technology SkillsUSA Club. She joined so she could improve her leadership skills.